Chocolate Fish says:"With a scooped neck and carrying a discrete Rugged South logo, these Tees & Singlets come in three mouthwatering colours, specially chosen to team with our Mt Cook Skivvy. Try Melon with Berry, Azure with Midnight, or Kalamata with Slate or Black. Made especially for Chocolate Fish. Machine washable." Material: The fabric is extremely soft to the touch yet appears to be exceptionally hard-wearing. I wore this as a base layer almost continuously! on a walk-camp-walk 2 day hill-walking trip in Shropshire during March and it kept me warm and dry throughout. What's more, the odour masking is quite stunning. I really don't think I'd have felt quite so happy in a garment based on a synthetic material. Since then it's been through a number of machine washes without any deterioration in performance or fit. Fit: (Tester - Female, 5' 7", slim build.) The fit was really quite flattering and the length is good. 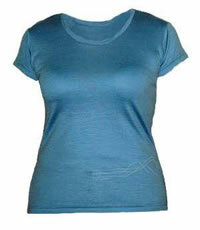 Wicking Properties: I tend to 'run hot' and I found the breathability/moisture management of the Merino to be good. True - I have worn some synthetics that had slightly more effective wicking but the overall warmth and comfort of the garment more than compensated. As a base layer this performed very well - it's extremely comfortable and has good moisture-management. It washed well initially but has since gone all 'bobbley' after repeated washings. It looks good enough to be part of your main day-to-day 'wardrobe' and it's available in a great range of colours. At £39.50 (!) it is certainly not the cheapest on the market but if you really must have a garment combining style, performance and versatility that you will not wear too often then this is worth considering.